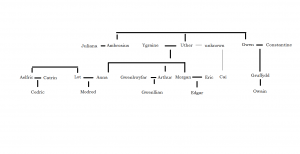 King Arthur’s family tree, as imagined by Geoffrey of Monmouth and others, is not a consistent lineage. For the purposes of Cold My Heart, I have taken what I hope is the best of the Welsh and the French/Anglo sources to craft a genealogy that makes sense, both historically, and for the purposes of telling a great story. Click on the image for full size. That makes sense that women weren’t regularly named in historical records, and would explain quite a bit. Geoffrey is slightly annoying for making things up and combining related and/or unrelated sources, but I guess that just makes it all the more interesting to dig through. Hello again. I’ve still been looking into answers for the confusion I had, and I came across this book (http://books.google.ca/books?id=V4-bzmtrFnwC&pg=PA219&lpg=PA219&dq=Geoffrey+of+Monmouth+Arthur%27s+relative+confusion&source=bl&ots=SPV2vX5R15&sig=LF3iaHOYJ1JbvokgnhKbRQAJH_s&hl=en&ei=ikF6TrClHu_q0QHGqsnnAg&sa=X&oi=book_result&ct=result&resnum=2&ved=0CCMQ6AEwAQ#v=onepage&q&f=false). The bottom of page 14 and the top of page 15 have an interesting theory. What do you think of it? It is also interesting the theory that Frank D. Reno, the author, has on the identity of Arthur -that he may be Aurelianus, Riothamus, and Arthur, all smacked into one person through textual and historical confusion. He has a strong argument, though not completely convincing, but it is an entertaining thought. Hi Jen! Geoffrey popularized King Arthur (for the Anglos/Normans/French), but the reason much of it doesn’t make sense is that he cobbled it together from a variety of sources. I’ve posted about this elsewhere (I have a whole section in the index on Arthur, you might have found it already), but historically, Arthur was solidly Welsh. The reationship of Tintagel to Arthur, for example, is completely unsupported. Geoffrey made a lot of stuff up. The hard part is sifting through it to find what is ‘real’, what might be real, and what couldn’t be. Also, if Geoffrey only named one sister, that doesn’t necessarily mean Geoffrey thought he only had one. Often women aren’t named in historical records. Beyond that, we’re all guessing! I realize that your genealogy is crafted of many sources and that its not supposed to be simply Geoffrey’s version. I am not critiquing your tree in any way. You seem to know quite a lot about Arthurian Literature, so I was wondering if you could help a fellow admirer of Arthur’s legend out. I am still a bit confused in regards to Arthur’s relationship between Gawain, Hoel, and Mordred in Geoffrey’s version. In Geoffrey of Monmouth’s story, he says at one point that “Hoel [the King of Brittany] was the son of Arthur’s sister, his father being Budicius, the King of the Armoricans”, and also saying that “In the time of Aurelius Ambrosius Loth had married Arthur’s sister, who bore him Gawain and Modred”. Thus Arthur has these three nephews. I am really confused by these kinship descriptions since the only sister attributed to Arthur in Geoffrey’s version is Anna, who has to be born after Arthur since Arthur is the firstborn of Uther and Igerna (and Anna is their child as well). So I wonder how old this would make Hoel to be King. Although I suppose young Kings weren’t all that rare. 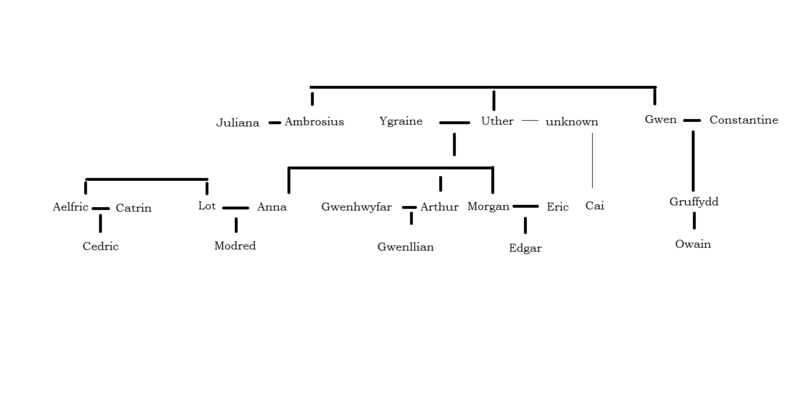 But then, in the instance of Gawain and Modred, it seems impossible that Anna could marry Loth in the time of Aurelius Ambrosius, since it was not until after his brother’s death that Uther met Ignera and had relations with her (producing Arthur and then Anna). I realize that, after Chretien’s version, Arthur is later associated with other sisters (Morgause, Elaine, Morgan le Fay, etc. ), but I think this would be irrelevant, since such knowledge is not given in Geoffrey’s text, where the problems I’ve stated are found. Maybe I am just reading it incorrectly or incoherently. I am using the “Romance of Arthur- An Anthology of Medieval Texts in Translation; New Expanded Edition” for my reading of Geoffrey’s story. Could you offer any advice? Do you think Geoffrey was simply not coherent in his writing and thinking, or is there something else going on that I haven’t caught? Or are the relationships to Arthur merely the old tradition of making characters appear more significant by having them associated with or related to Arthur? I could see how, Arthur being Mordred’s eldest (and only) Uncle on Mordred’s mother’s side would be important, since that relationship (between eldest Uncle and nephew) was held to be the strongest at least by the end of the eleventh century. Thus such a betrayal would be all the more horrendous. I just wish that (if Geoffrey is using kinship relations to convey an emotional point) they would at least make sense rationally. Can you help me clarify my understanding of Geoffrey’s version of Arthur’s family?